Proclaimed Oral and Intangible Heritage of Humanity by UNESCO. The Mystery Play of Elche is a medieval sacred musical drama of the death, the passage into heaven and the crowning of the Virgin Mary. 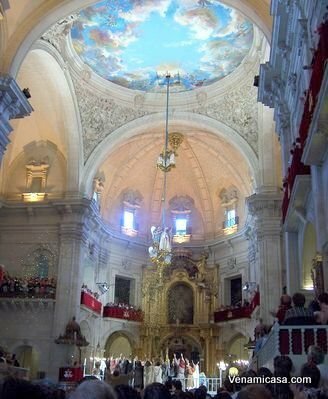 Since the mid-fifteenth century it has been performed in the Basilica of Santa Maria and in the streets of the old city of Elche. 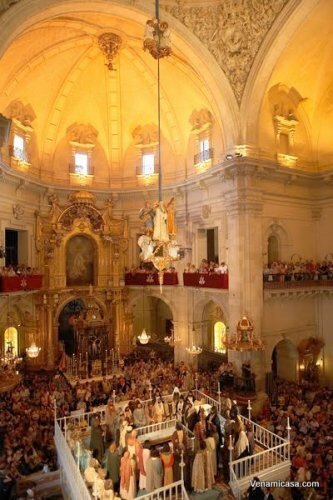 It is a living testimony of European religious theatre of the Middle Ages. This theatrical performance (protected by several laws aimed at safeguarding cultural heritage) is entirely sung, comprises two acts, performed on 14 and 15 August. 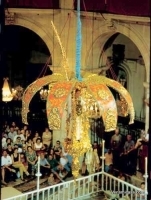 These depict the death and crowning of the Virgin in a series of scenes and related paintings: the death of Mary, the night procession that is followed by hundreds of participants carrying candles, the morning procession, the afternoon funeral procession in the streets of Elche, and the enactment of the burial, Assumption and coronation in the Basilica. 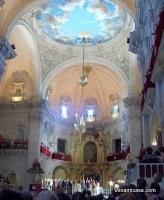 The texts are in Valencian (the local form of Catalan) with certain sections in Latin.The stage has two levels: the horizontal “terrestrial” stage and the vertical “celestial” stage, characteristic of the medieval mystery play. Ancient aerial machinery is used to enhance the spectacle by means of special effects. More than 300 volunteers take part in the performance each year as actors, singers, stage directors, stagehands, tailors and stewards, as well as in the preparations that last throughout the year.This tradition, which attracts the entire population of the town, is closely linked to the cultural and linguistic identity of the inhabitants of the region.